The General Services Administration’s (GSA) IT Solutions Navigator is an online portal for IT-based purchasing. Businesses must be properly registered in System for Award Management (SAM) to use the GSA’s IT Solution Navigator. The IT Solutions Navigator uses customer requirements to provide the best-fitting GSA contract vehicle, as well as an appropriate point-of-contact for more information. 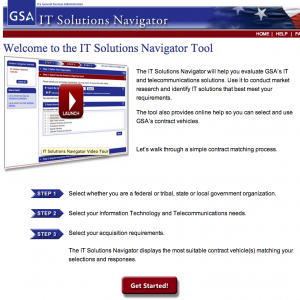 GSA’s IT Solutions Navigator makes it easy for government contracting officers and procurement teams to conduct pre-acquisition market research on IT products and services. The IT Solutions Navigator features video tutorials, and a live-chat function that allows users to chat online directly with a Customer Service Representative (CSR).